You are here: Home / clothing deals / FabKids: 3 piece outfit plus FREE tee and $25 credit for $25 shipped! If you’ve got little ones, then you’ll know that they are constantly outgrowing their clothing and trying to keep them clothed can be expensive! 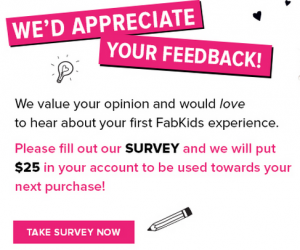 With FabKids, right now you can design a custom 3 piece outfit to fit your little one’s personality and you’ll get it for just $25 shipped! Plus, after you complete your first order, you should receive an e-mail with a survey and an offer for a $25 credit! This means your next outfit will be just $15 shipped! NOTE: A “completed” purchase means that you have received your order and can share feedback about your purchase! So, you’ll be able to get 2 super cute outfits plus a tee for just $40! That’s a total of 7 pieces of clothing for $40 or $5.71 per item! The best part is that they offer free returns, too! So, if something doesn’t fit right, it’s easy to return and exchange! Right now they only have styles for girls in sizes 2-8. 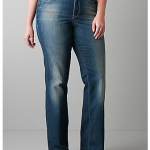 Lane Bryant Jeans for $29.99 plus 40% off clearance! i submitted an order yesterday and haven’t got a survey to earn the extra $25 credit!?? Amanda, I’m guessing by complete they mean that it ships and you receive it so you can give feedback on your purchase. I wasn’t able to order because they don’t have my daughter’s sizes right now. Update: I checked with a friend who did order and the e-mail came after her first order arrived. Well, my order arrived yesterday. So, I hope I get my email soon! Several people, myself included never received surveys..
Heather – Have you received your box yet? The survey is about your purchase, so you should receive it after you receive your purchase. Also, companies can change promotions at any time. I would imagine that since this is a relatively new company, they will still offer the survey and credit because they want feedback and repeat customers. Aimee have you been checking your SPAM folder?